I'm excited about this week's cookie. It's (mostly) allergen-free and uses two new-to-me products from SunButter and Bob's Red Mill that have changed my life. It's week two of National Cookie Month and this week we are sharing cookies that are the best shippers. Care packages sent to loved ones, soldiers and military overseas and random holiday cookie swaps all beg to have fresh, delicious carefully packed cookies. I'm not an expert on shipping baked goods, as I've only done it a few times, but fellow #cookiemonth14 blogger Wendy at The Monday Box sends a care package to her son each week, so I defect to her expertise. Please check out her blog for best cookie shipping practices. 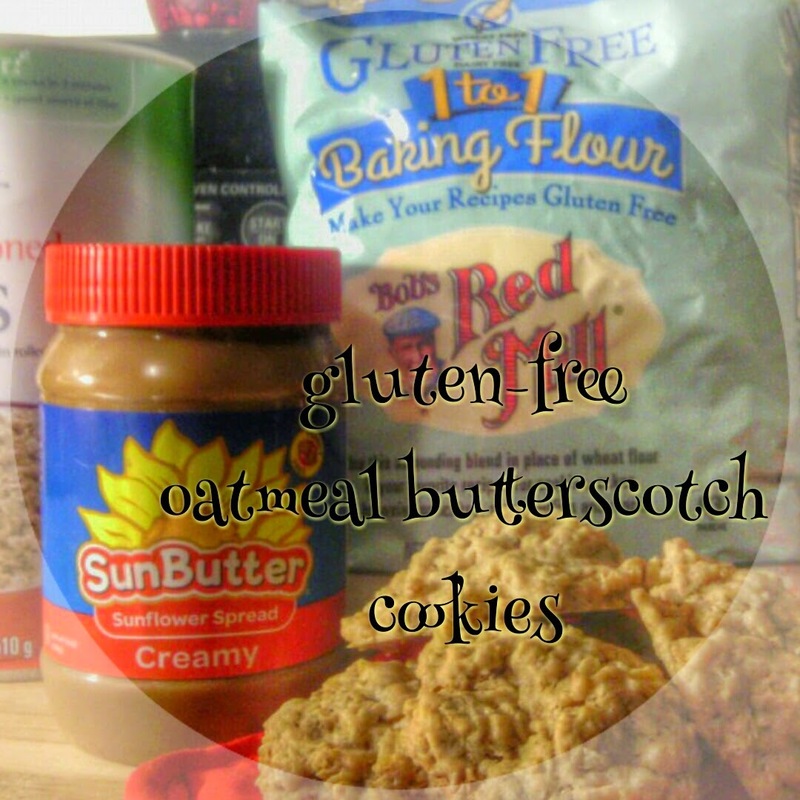 I LOVE oatmeal butterscotch cookies. They're my favorite and it's been documented. As much as I love them, I usually have to make them myself because most bakeries cannot guarantee a truly allergen-free confectionery item. A few things I can't have: tree and ground nuts, most stone fruits. I'm not gluten-free, but I empathize with others who have dietary requirements and these cookies are perfect. I've never used a gluten-free baking mix before and Bob's Red Mill gluten-free flour blend completely blew away my expectations. I didn't have to add a thing. I only added an egg and baking powder for leavening. Instead of using pre-made butterscotch chips, I took my idea one step further and made SunButterscotch chips! A blend of roasted white chocolate, SunButter and a pinch of salt produce roasty, toasty, sweet chips that I had to stop myself from eating by the handful. SunButter allowed me to have the first 'butter and jelly sandwich I've had in EIGHTEEN YEARS! Nut-free and soy-free, and made from non-GMO sunflower seeds, I'm always going to have this in my fridge! I love this stuff! Squeeeeeee! These cookies bake up crisp and sweet, just like gluten-filled cookies. Preheat oven to 350°F. Cream butter and sugars together until smooth. Add vanilla and eggs; beat well. In a separate bowl, blend flour, cinnamon, baking powder and salt. Stir flour blend into wet ingredients. Add oats, SunButterscotch chips and mix well. 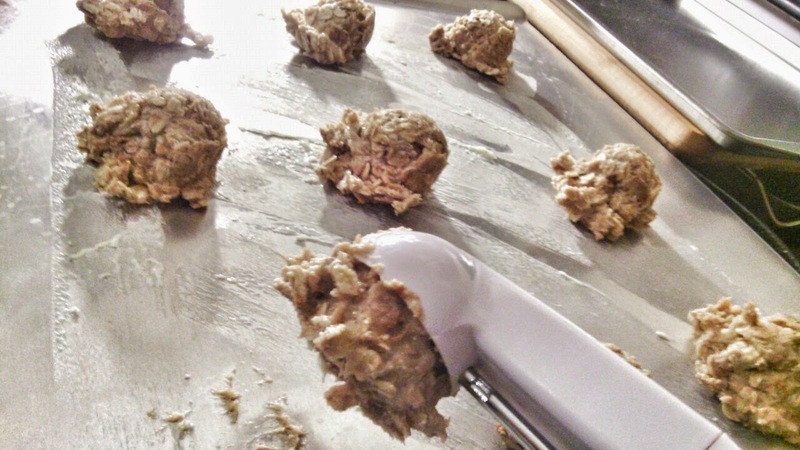 Drop rounded tablespoons of dough onto ungreased cookie sheet. Bake for 10-12 minutes, or until golden brown. Cool one minute then transfer to wire rack. Makes about 2 dozen cookies. Sprinkle the white chocolate chips on a baking sheet and place it in the oven for ten minutes. Remove it from the oven and spread it out with a dry spatula. Continue to cook it in the oven for an additional 30-40 minutes, stirring and spreading it out with the spatula at 15 minute intervals. Cook until the white chocolate is peanut butter brown color. Remove from the oven and scrape it into a medium bowl with a pinch of salt and the SunButter. Stir the ingredients until they are thoroughly combined. To make chips: Line a sheet tray with plastic wrap, foil or wax paper. Place the SunButter mixture in a piping bag fitted with a small tip or plastic bag with a small hole cut in the corner of the bag. Lightly squeeze the bag and make a chip the size of a nickel. Repeat. Place the sheet tray in the freezer for a minimum of 30 minutes. When ready to use the chips in the above recipe, use them in the recipe frozen. Those sound wonderful! Thanks for sharing how to make our own chips - that's super easy! Oh these sound so yummy!! I would love to ship cookies to friends and family this Christmas, so this post is just in time. These cookies sounds fantastic! My hubby is a butterscotch fan so this is perfect. I ship to my son and my sis. We try to outdo each other with each package. It's gotten really out of hand. These cookies look soooo good! I use a lot of Bob's Red Mill and love their products, too, and I'm glad you have found a gluten free flour you like! Can't wait to try these cookies! Mmm, cookies!! Bring them on! I like how you have the white chocolate chips in there too! We are big SunButter users since my daughter is allergic to peanuts...and I can't wait to try making these chips! Thank you!! These sound scrumptious and making your own chips - brilliant! I use sun butter all the time. It's one of my all time favorite products. These cookies look wonderful. I'm going to have to try them ASAP. Thanks for the recipe. I have a friend coming over this weekend that has a GF diet and I am completely clueless about it. I know there are many recipes out there but I think this is the winner. Thanks!